Today I am so excited to share today’s post with you. Not only do I get to share with you a recipe that screams Buffalo, NY, my hometown, plus I get to share with you my weekend in Wooster, OH with the wonderful people of Certified Angus Beef and the #SundaySupper family. I was lucky enough to get picked to go for this special weekend to the Certified Angus Beef Education and Culinary Center. Let me tell you, they can fit in so much information in two days, not to mention all of the food I ate. I am not exaggerating when I tell you I had the best beef of my life while at the CAB. I didn’t know beef tasted so good. With everything that I learned, I am sharing with you a simple roast recipe that is sure to please. 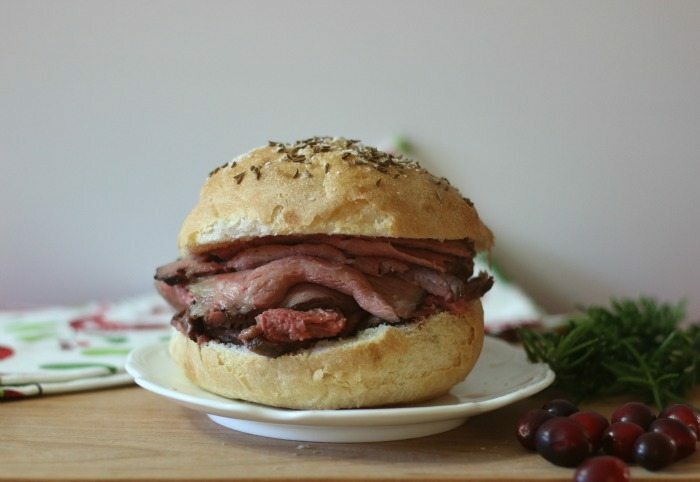 It is my Roast Beef on Kimmelweck Rolls. Mmmmmm, this sandwich brings back great memories. This is the sandwich I was brought up on. Ok, that’s a lie! When in grade school my mom used to make me bologna and butter sandwiches on Wonderbread. Gross! To this day, I don’t like bologna. Anyway, back to the sandwich. For the beef I used Certified Angus Beef Sirloin Tip Roast. I originally wanted to make a Prime Rib, but when I spoke to the butcher he said that it’s harder to come by in California and is $17.99 a pound. I thought oh my gosh! If I ruin this roast, it will be mighty costly. Apparently some beef is harder to get on different sides of the United States. On the West Coast sirloin beef is very easy to get, where as on the East Coast it is harder to find. The same goes with Prime Rib. Hard to get on the West Coast, which is stinkers! Kind weird how it works that way? 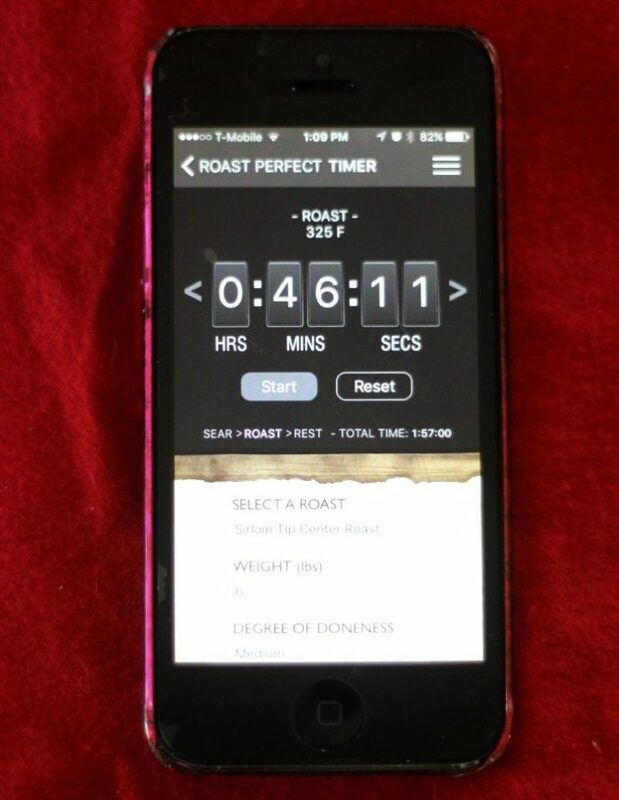 To cook my roast I used the Roast Perfect App. I love this App and it’s free to download to your phone. Just go to the App Store and search Roast Perfect. I picked the beef that I had, put in the pounds and the app told me the rest. There is a timer, so when it’s done my phone beeps. The Roast Perfect App told me to Sear for 15 minutes at 450 degrees, than lower the temperature to 325 to cook for 1 hour and 27 minutes. After the roast was done I checked the temperature and it was at 132. I wanted it to be around 145 for medium doneness. I took my roast out and covered it for 15 minutes. Sure enough it was cooked perfect for me. It was still pink, and cooked to the way I like it. You can always choose what doneness you prefer. For the rolls I made simple, almost homemade Kimmelweck Rolls. 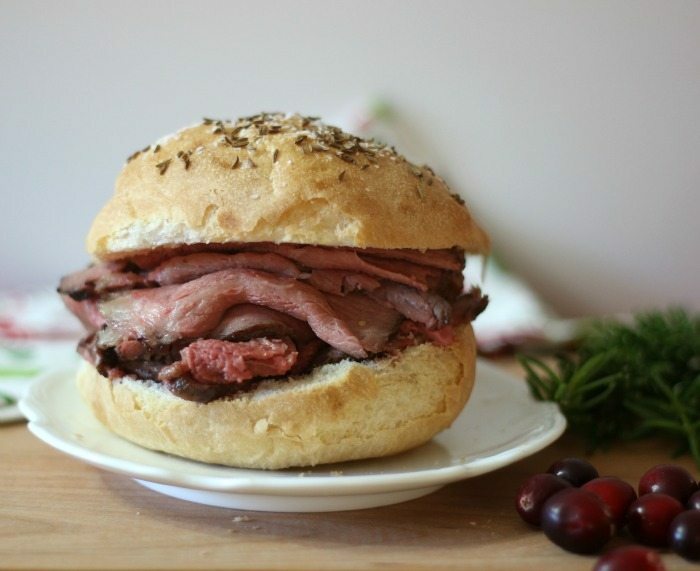 For those who don’t know what a Kimmelweck Roll is, it is a traditional roll used for roast beef sandwiches. 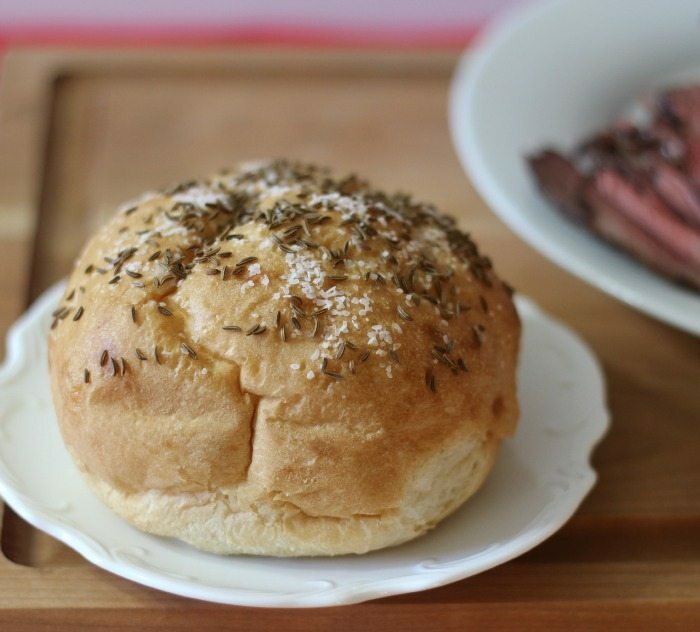 It is a Kaiser Roll that has been topped with pretzel salt and caraway seeds. Most people who I have met, have no idea what it is, but trust me, try it once and you’ll love it. A roast beef sandwich is not the same without it. All I did was make a simple cornstarch and water solution, brushed it on Kaiser Rolls and sprinkled with salt and caraway seeds. Bake in oven for 5 minutes. So perfect! I am so loving this sandwich. I can’t get over how much it tastes like home. It does bring back wonderful memories of going for car rides along Lake Erie and hoping that a stop to Anderson’s Roast Beef was going to happen. 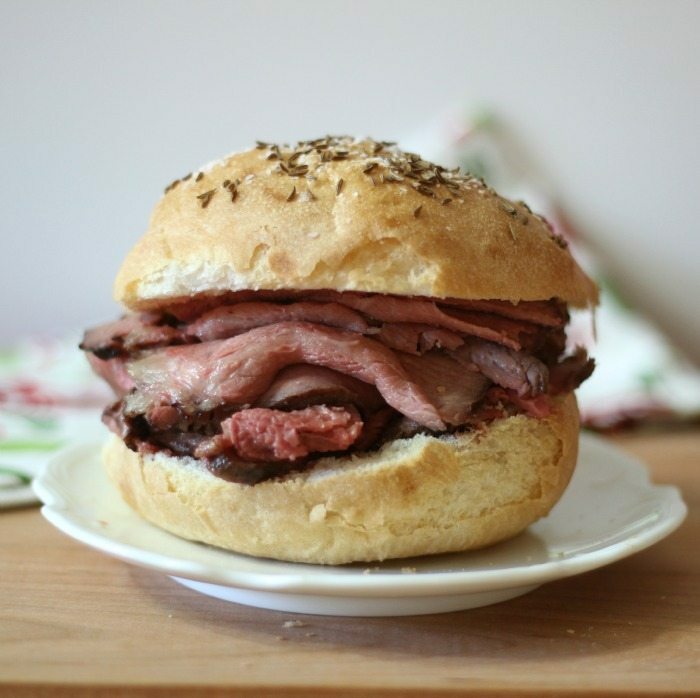 A tender juicy roast, that has been thinly sliced and top on an almost homemade Kimmelweck Roll. Bring beef to room temperature. Rub with olive oil and sprinkle with salt and pepper. Place roast, fat side up on rack in a shallow baking pan. Bake for 15 minutes. Lower temperature to 325 degrees and cook for 1 hour and 27 minutes, Until internal temperature reaches 145 degrees. 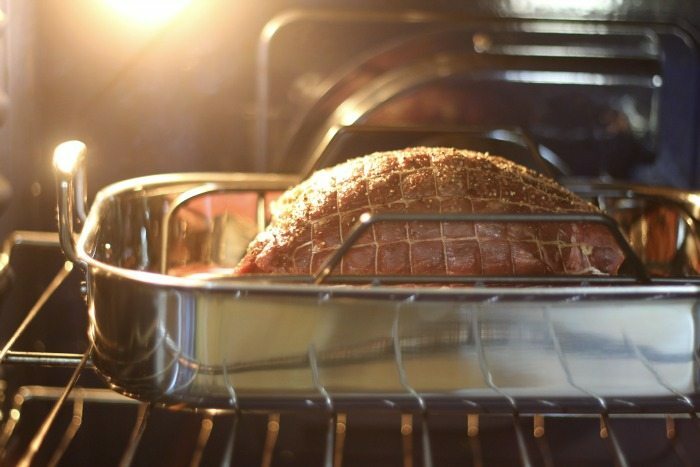 Take Roast Beef out of oven and let it rest for 15 minutes before serving. Cut into thin slices. NOTE: Do not turn off oven. Brush cornstarch glaze over kaiser rolls and sprinkle with caraway seeds and course salt. Place on baking sheet and bake in oven for 3 minutes until salt and caraway seeds stick. Cut rolls in half, add beef to rolls and a spoon full of juice from the pan. Add horseradish if desired. 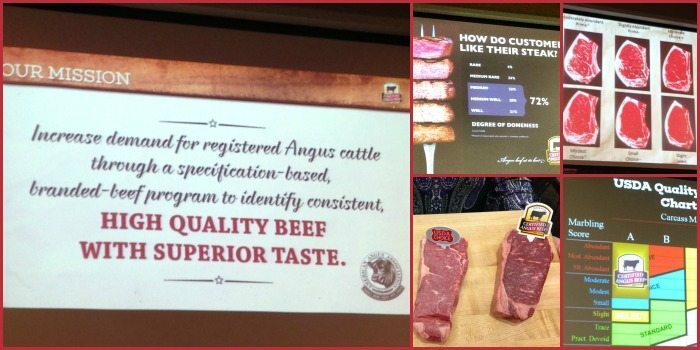 I wanted to tell you a little bit about my trip to Certified Angus Beef brand Roasting Retreat. 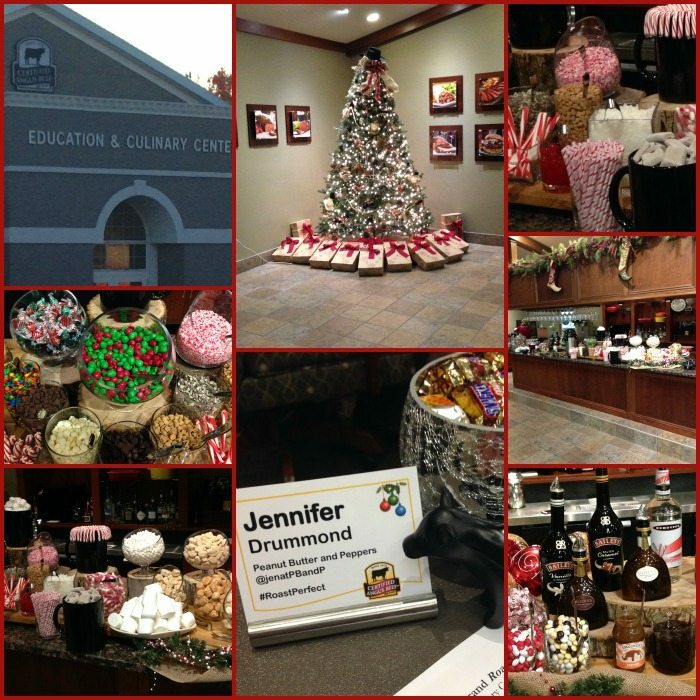 When I arrived on Saturday morning to the Certified Angus Beef Education & Culinary Center, I was greeted by awesomeness! Yes awesomeness! I walked in the door and my face lit up like a kid in the candy store. I looked to my right and saw a Christmas tree with presents under it. Then I looked a little bit further and I saw a bar full of candy, marshmallows, hot cocoa, coffee’s, drinks and so much more. You truly have no idea how excited I was. They had tables set-up with our names on little tags, placed next to my name I had my own bowl of candy with my baby cow. You may have noticed baby cow on Instagram. I love this little cow. After getting settled in and after I stuffed my face with M&M’s, I learned so much about beef. I learned that cows are grain and grass feed. That the best kind of meat to purchase is the kind with little white specks of fat in it. Those little specks of fat is actually good for you. They are Omega 6’s which is what our body needs. I also learned how people like to have there beef cooked. Medium seems to be the most popular. I can tell you that Certified Angus Beef brand takes pride in there beef and they know there ranchers and what they feed the cows. After learning about Certified Angus Beef Brand, the fun stuff started. 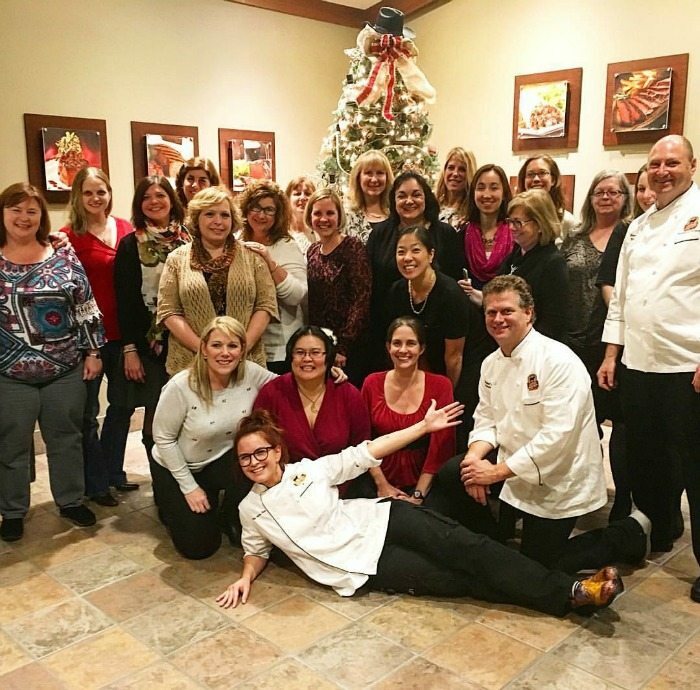 We met with Chef Michael Ollier and Ashley Pado. 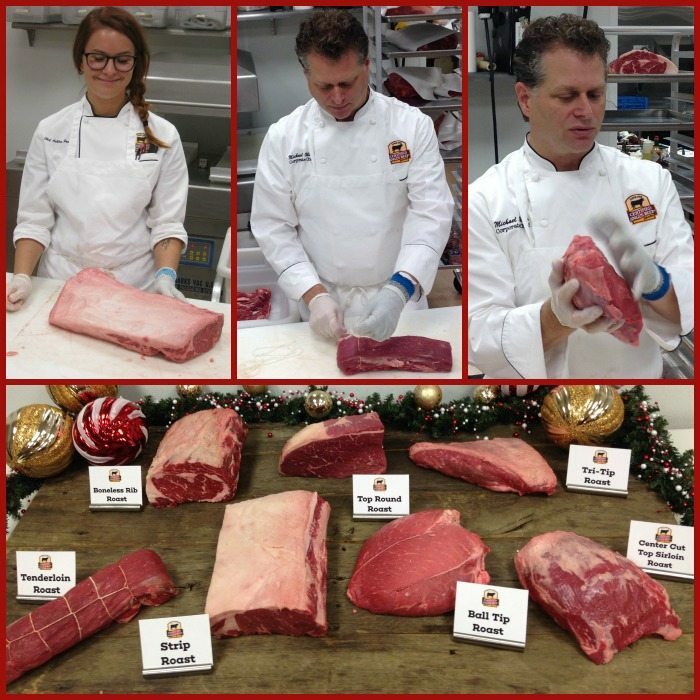 They taught us how to pick out the perfect beef roast. How to trim beef and how to tie a roast. I was pretty lucky because my roast in today’s recipe was already tied for me. We also met up with Chef Tony Briggs who taught us how to make rubs and sauces for our roasts. I love Chef Tony Briggs, he is so funny! He had me laughing as I was learning. It was pretty cool because they took us to the backroom along the kitchen and where we got to make our own spice rubs. I still haven’t used them, but plan on it soon. 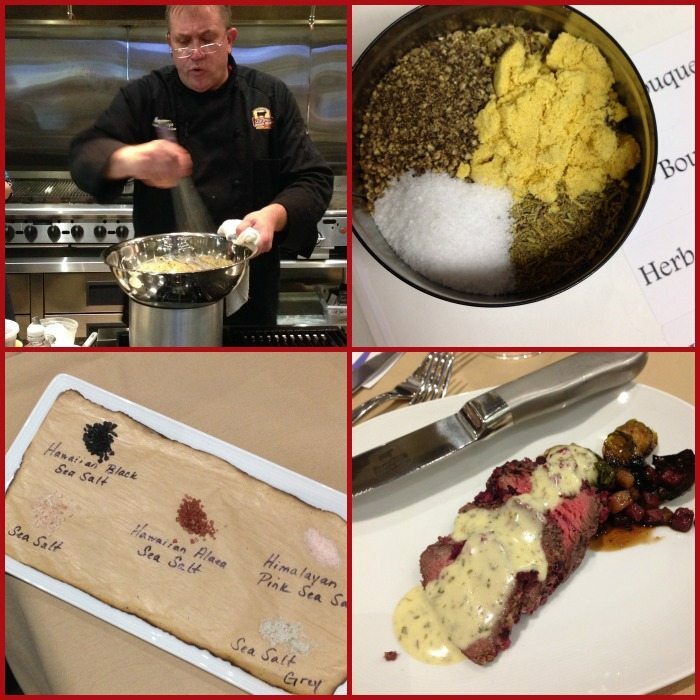 Chef Briggs also taught us how to make a Bearnaise sauce, and roux. I’ll be honest this was the first time I have ever had Bearnaise sauce and it was amazing. How I have lived this long without it, I’ll never know? 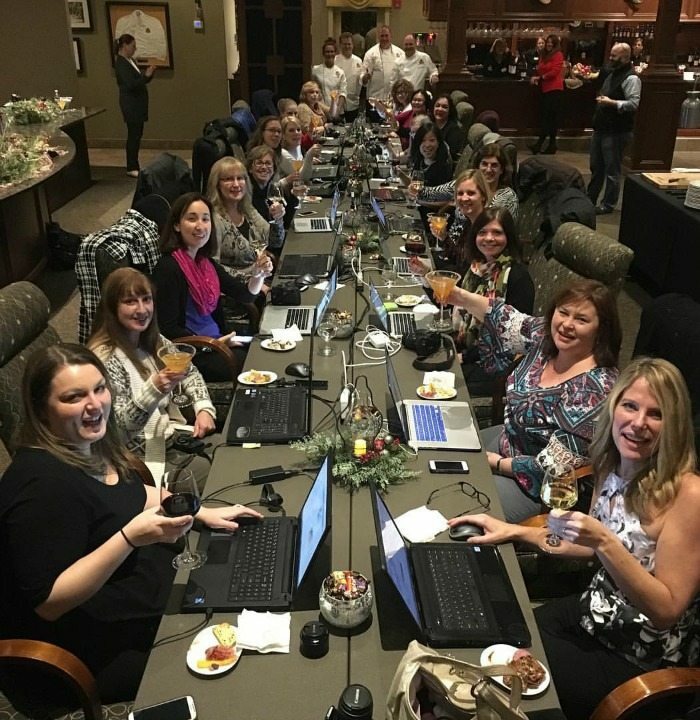 One of my favorite parts of the event was being able to have a Twitter Party with the #SundaySupper gang. I actually tweeted so much during the day, that I broke Twitter. It told me I exceeded my tweets for the day and I couldn’t tweet anymore. Crazy! I had the best time ever! So much food. Our lunches were like dinners and dinners, well like dinners. It was so good! I can tell you, I don’t think I ever ate so much on a weekend, but so worth it. I tried so many new things and even got to try a pieces of a 6lbs. burger. Oh yeah, you heard me right! Here is just a tiny portion of my eats for my weekend! Here are some fabulous beef recipes from the #SundaySupper gang. I am so happy that I got to meet them. Everyone is so kind and own to Earth, it really did feel like family. I had the best time and I think you can tell by the photos. I want to thank the folks of Certified Angus Beef for your hospitality and taking the time with all of us to teach us how to make the perfect roast. 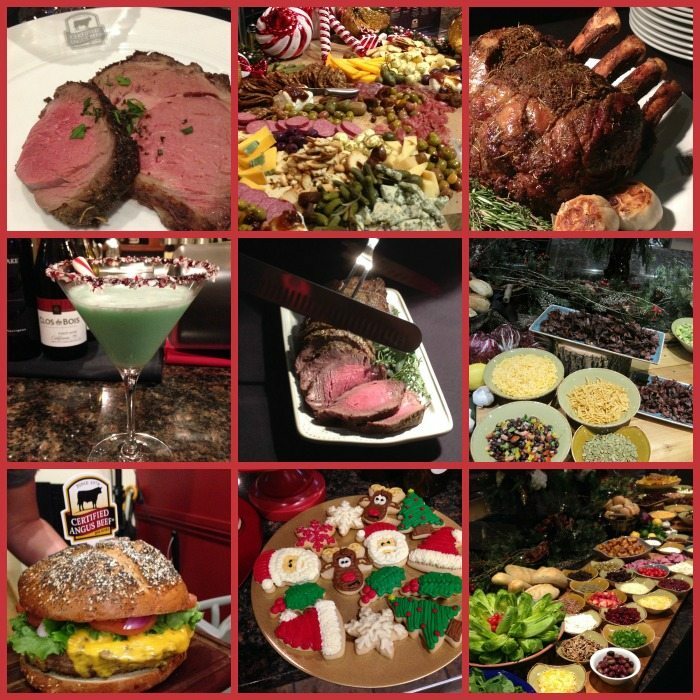 Oh and don’t forget to download the Roast Perfect App to help with your holiday roasting. For more information on Certified Angus Beef you can go to the following websites. I was given this opportunity to go to Certified Angus Beef Brand Education Center by Sunday Supper and the fine folks of Certified Angus Beef. I was not asked to write this post, and all opinions are my own. It was SO great to meet you in person! Also being from Buffalo, this is a sandwich my mom and I have unsuccessfully tried to recreate a few times. We’re so making yours using only the best beef of course! 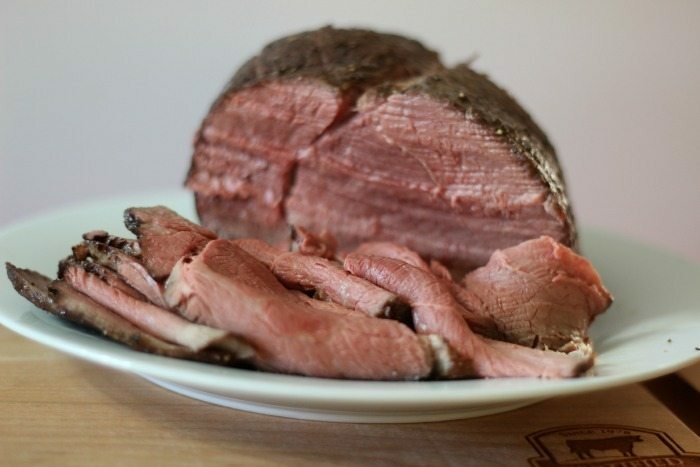 I tried the roast perfect app for a 6 pound sirloin tip roast done WELL and it came out medium rare, closer to rare! (Note that my oven always cooks spot-on or slightly hot). I put it back in and got it to more of a medium, but the ouside was getting really dry; I ended up slicing the whole roast and putting the slices in in batches for an additional 5-10 min each until they were medium-well to well. This took a loooong time (originally should have been a 9 PM late dinner, finished cooking the last of it at 11:30 PM). The end results were good, but I’m not impressed with the app! I have been cooking for several years, but this was my first attempt at a roast – I thought the app would make it easier; unfortunately I think it will be a while before I try a recipe like this again. Finding this recipe was exactly what I was looking for with regard to the rolls. I needed these rolls in a hurry and all the bakeries said they would need a 24 hour notice. I used your quick cheat no one was the wiser. I know can have beef on weck any time.